Kinetica will be showing works by Balint Bolygo, Elod Beregszaszi and Jose Manuel Gonzalez at Mad Atelier, a new gallery, boutique and architecture studio in east London. 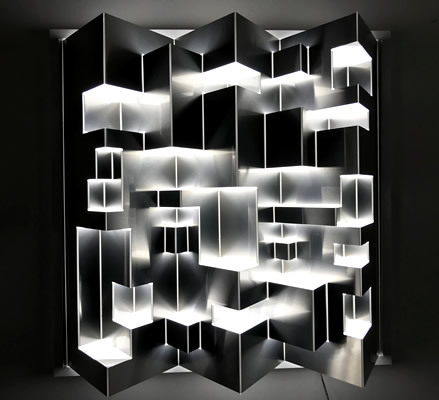 Kinetech Design is a new collaboration between Balint Bolygo and Elod Beregszaszi, specialising in foldable and illuminated kinetic structures. Kinetica Artist Member Jose Manuel Gonzalez will be showing his geometric light sculpture ‘Window to Infinity’. The exhibition at Mad Atelier will explore different ways of filtering light through photography, movement, sculpture and architecture, and also features the artists Samuel Levack and Jennifer Lewandowski.